Somersham's busy high street is quite a contrast to the narrow lanes that snake through the hills around here. 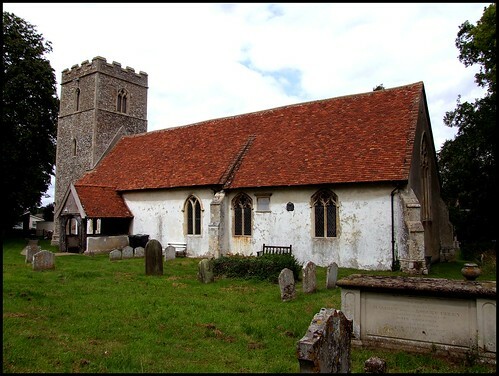 The church is also in a thoroughly domesticated setting, compared with the wild beauty of adjacent Nettlestead and Little Blakenham. But it is a pleasant setting nonetheless, and the unbuttressed tower, as you approach it, keeps the church hidden like wings tucked behind its back, giving it more power than the 14th century usually allows. This is not a glamorous building. 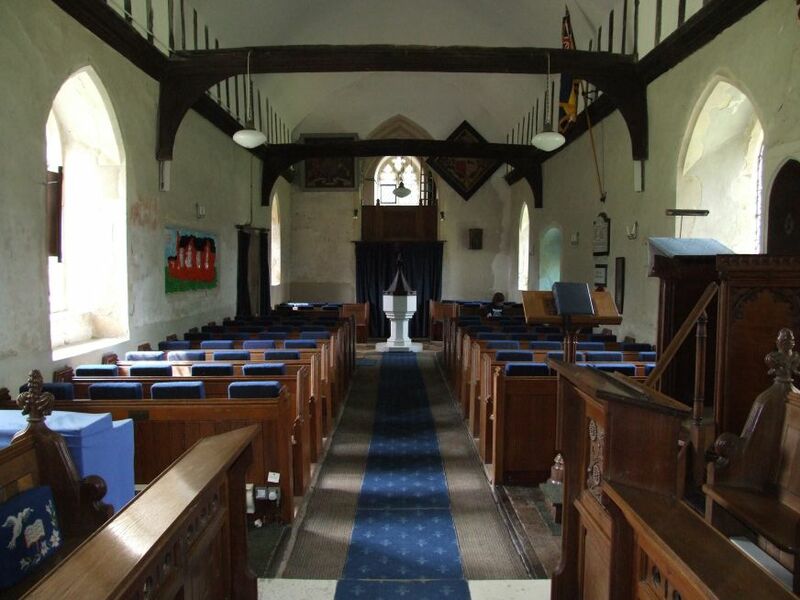 But it is a church full of interest, and a visit here is a thoroughly enjoyable one. For a start, the great splays of the wooden porch are cut from a single piece of wood in the 13th century. This is probably Suffolk's oldest porch entrance. 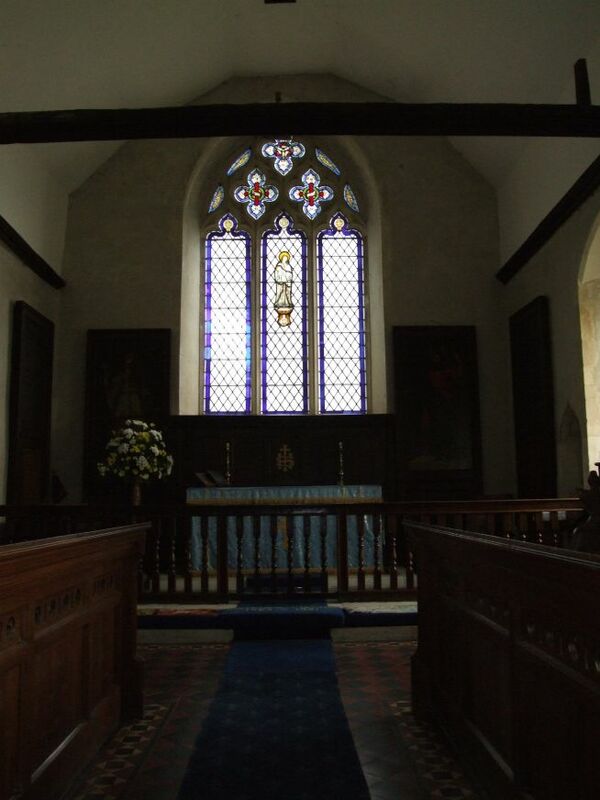 And inside, St Mary has a lot of what Pevsner calls 'curiosa' still in situ. Perhaps the most interesting, if least spectacular, can be found on the most easterly tie beam, above the sanctuary. 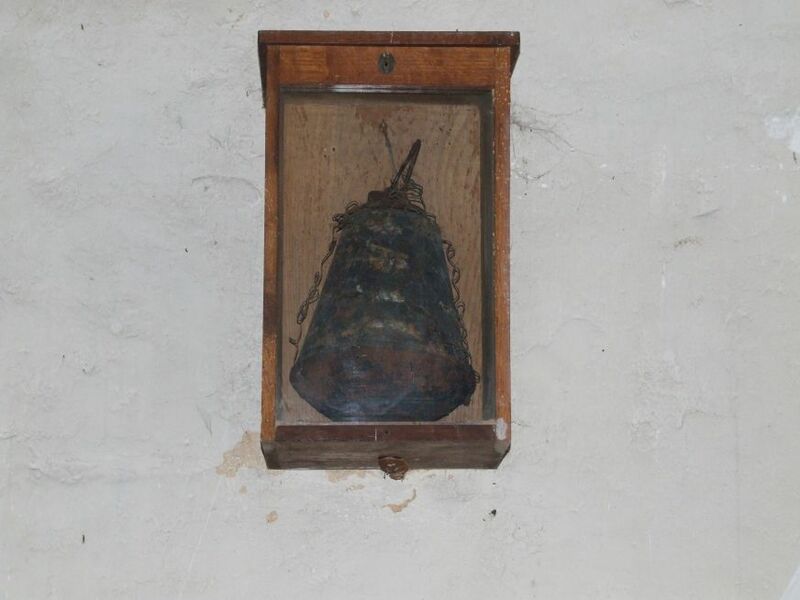 The two pieces of wood that stick up from it are the stirrup of the medieval sanctus bell, used during the consecration at the Mass. 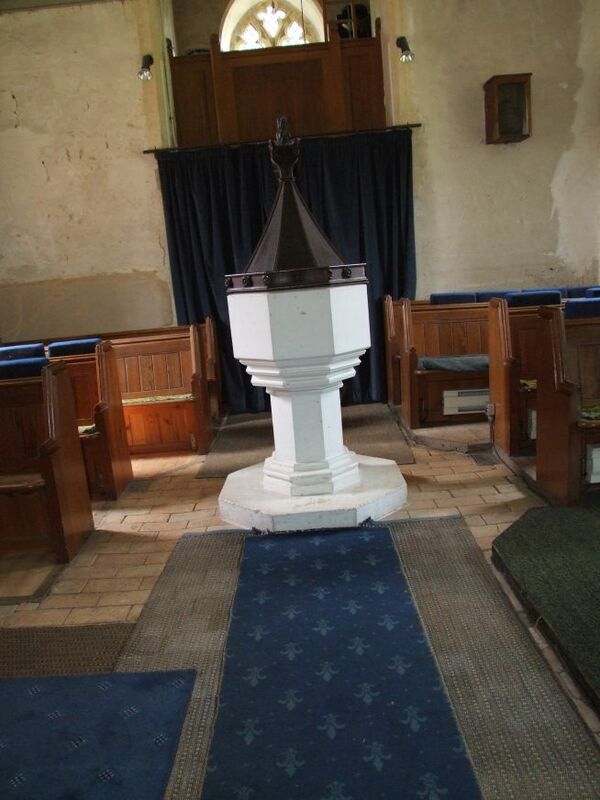 In a small church like this, a bell in the tower was usually nominated for this purpose; perhaps this was the result of a bequest. It is an unusual survival. The next tie beam west probably served as the rood beam. Follow the line of the wall plate of the roof to the back of the church, and you'll notice wooden pegs sticking out of each side. Cautley, in a fit of the medieval romanticism to which he was occasionally prone, thought them garland hooks, used for suspending a crant of flowers, as a symbol of virginity, at the funeral of a young girl. However, given that there was a gallery here from the 17th to the 19th century, they might more likely have been cloak-hooks. On the west wall hangs a grand Charles II coat of arms, with a hatchment to the Bacon family to the north of it. Beneath the hatchment, in a glass case, is a bomb dropped from a Zeppelin onto the parish in World War I. There's another coat of arms, for George IV, above the pulpit on the north wall. This is a beautifully cut piece of fretwork, probably produced locally. 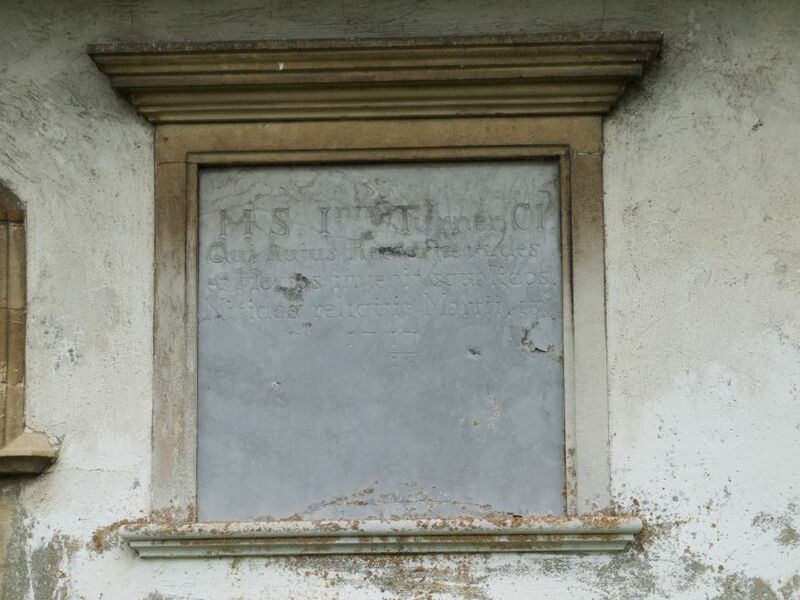 On the opposite wall is a curious rectangular recess, about a metre long, which has been pressed into service as a noticeboard. Presumably, it was designed originally to contain a memorial. An excellent post-Reformation survival is the pairing of Moses and Aaron either side of the decalogue, still in their original position at the east end. They are two of the best in the county, I think. 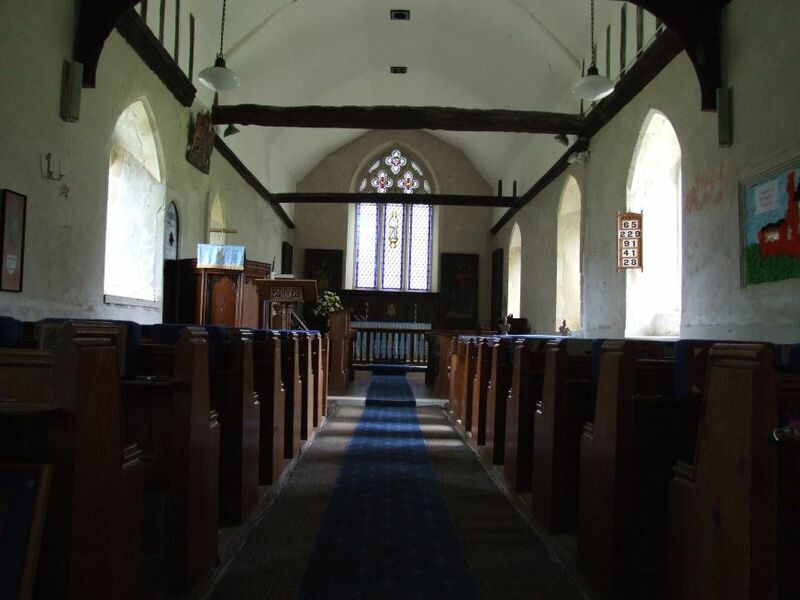 But I wouldn't want to give the impression that St Mary is some kind of museum, because there is a strong sense of a busy, lively church at the centre of its community. It is obviously a well-loved and well-looked after building. The present worshipping community continues to contribute to its development, most obviously in the form of the outstandingly good half-roundel window that fills the archtop of the former north doorway.This shows a variety of Suffolk wild flowers, and was put up in the 1990s. It is by Surinder Warboys, and her work can be seen on a grander scale at Chillesford. Wandering outside in the trim graveyard, I was interested to see what seemed to be a rather large brick buttress in the north wall. 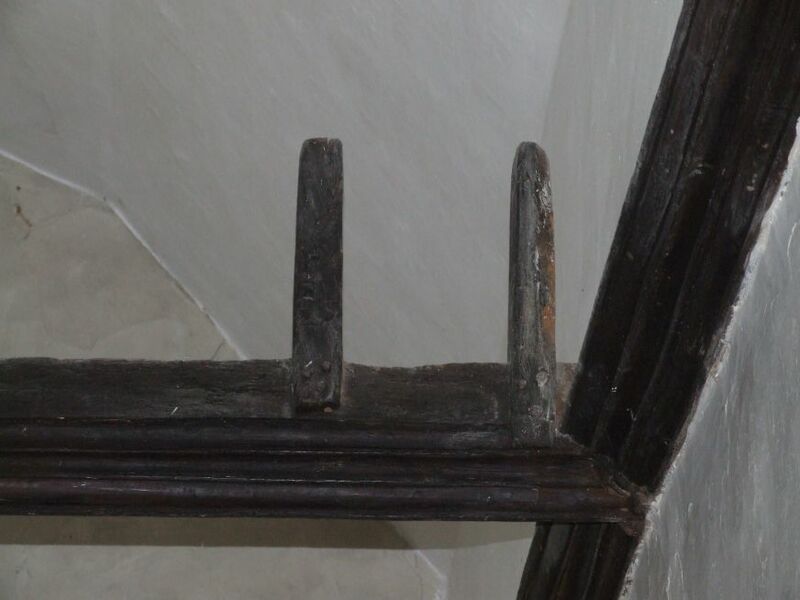 It is the case of the former rood loft stairs. And then, heading west again, I looked back to see that the church had folded its wings, and huddled back behind its tower. The man gardening by the adjacent bungalows nodded a cheery hello, the driver who waved me out at the turning smiled serenely, and the lady in the shop where I bought provisions for my journey was also very pleasant. What a nice place! Somersham surprised me. It is a proper, old-fashioned village, with its High Street, shop, pub, garage, church and school. So many settlements out here are scattered and centreless, or huddled little hamlets. Heading out from Ipswich, Somersham struck me as the last sign of semi-urban civilisation. Beyond here, wild Suffolk awaits.